This is the second in a series of posts about the AsyncPattern in WCF. The previous post described the consequences of setting AsyncPattern = true on an OperationContractAttribute. However, a question still remains: when and how to use AsyncPattern = true on the service-side? My conjecture is that asynchronous operation implementation should be used when there are conditions to release the calling thread, without requiring the creation of a new thread, and the time needed for the operation completion is significant. This happens when the operation performs “lengthy” IO requests. If the IO interface has an asynchronous interface, then the asynchronous operation call can be “linked” to the asynchronous IO call (see diagram below). Note that a service request is just a special kind of an IO request and that WCF also provides an asynchronous interface for clients. 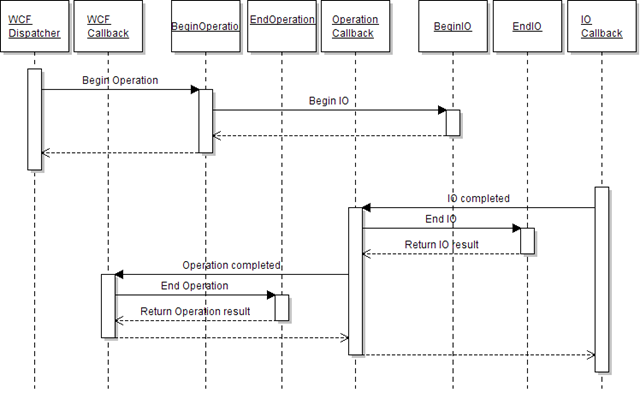 The following sequence diagram shows the “linkage” between the asynchronous operation implementation and an asynchronous IO request. The WCF dispatcher calls the BeginOperation method, which in turn starts the asynchronous IO request (BeginIO) and returns immediately,. This sequence is done on an IO thread, which is “released” after BeginOperation returns. Calls EndIO to finish the IO request and collects the IO result. Calls the WCF provided callback (passed as a parameter to BeginOperation). The WCF callback then calls EndOperation to finish the operation and collect the operation result. The “left-to-right” sequence processes the request, running on the IO thread associated with the service request. The “right-to-left” sequence produces the reply, running on the IO thread associated with the IO request completion. Namely there is no blocked thread between the start of the operation and the completion of the IO. This property is important in scenarios were there can be a significant amount of operations waiting for “lengthy” IO requests (e.g. middle-tier services). This entry was posted in Uncategorized and tagged concurrency, WCF on June 28, 2008 by pedrofelix.